House of the Dying Sun rushes ahead with furious focus and great urgency, and it’s hard not to get caught up in its dark current. It sweeps aside the space-opera trappings of modern sci-fi in favor of something more resolute and grim: You’re the bad guy. There are the good guys. Go make an example out of them. The tale it tells is old as time: “Some people messed with you. Kill them.” Slightly longer version: you’re a deadly fighter pilot who works as an executor for the imperial army in some remote space empire. There’s been a coup, and your emperor has been murdered. You have been charged with enacting justice upon all of the traitors who arranged his murder. 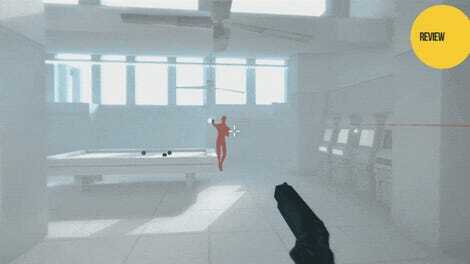 You’re basically a space assassin, and each mission gives you a new target. Missions have evocative names like “Slaughter at Tannhauser Gate” and “Vengeance at Ember Field,” and each one is accompanied by creepy flavor text. “Priestess Hara has been spotted training prototype drones in the Firelands. Purge her.” That’s as far as it goes. Dying Sun mostly gets its narrative elements out of the way so you can focus on flying, strategizing, and shooting. Missions are brief, brutal affairs in which you and your squadron murder everything in your sights. You’re not a hero by any stretch—you’re the iron fist of a fanatical regime. When one of your targets ejects, you track their escape pod and blow it to dust. In one mission, your targets are a pair of shuttles carrying the families of your enemies. It’s telling that the battlecruisers, transport ships and fighters you go up against are all coded blue on your heads-up display while you and your allies are coded red. We all know who had the red lightsaber. 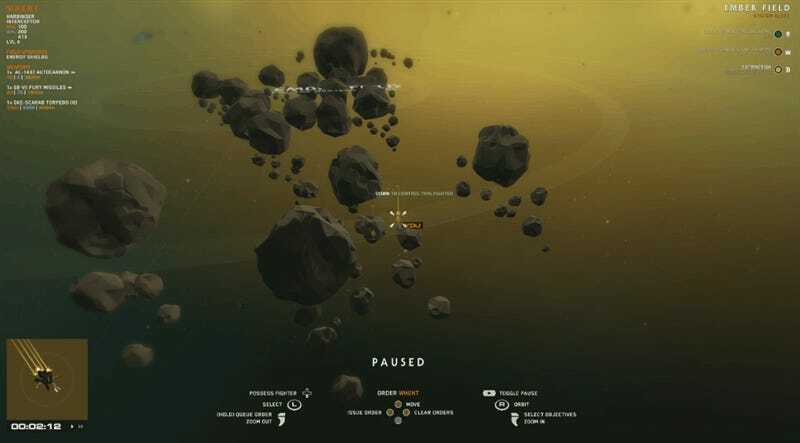 With the narrative at the margins, Dying Sun is freed up to focus on the main event: space combat. This is fast-moving, aggressive dogfighting against a variety of enemy ships. It’s more in the vein of TIE Fighter and the other Lucasarts X-Wing games than something slower-moving and more considered like Elite: Dangerous. This is not an easy game, but with each death you’ll learn something before being quickly thrown back into the action. 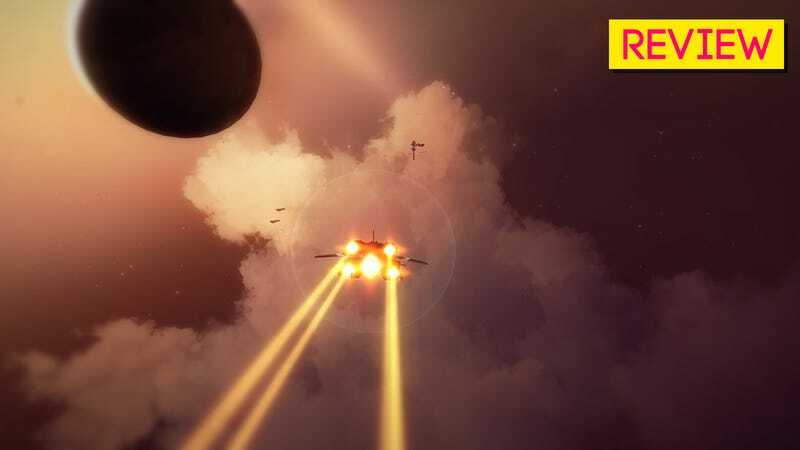 Space combat in House of the Dying Sun is well-tuned and consistently enjoyable. Enemies stack on top of each other effectively. Unshielded fighters aren’t much of a threat on their own, but leave too many unattended and they can ruin your day. Large, shielded dreadnoughts are easy to outrun, but do a good job of guarding more vulnerable targets. The higher the difficulty of the mission I attempted, the more I had to pause the game mid-fight and plan new strategies on the fly. There are just 14 missions in the game, and on the easiest difficulty a player could blow through them in an hour or two. But they’re designed to be replayed, and at their highest difficulties each one becomes a gnarly test of wits and skill. Objectives vary from mission to mission—some have you escorting a friendly cruiser, others have you taking out a pair of shielded enemies, and so on. In the end, however, it boils down to flying around and shooting things. No landing, no exploring, no boarding parties. After a certain amount of mission time has passed, an enemy flagship will jump into your sector and deploy a raft of fighters and missile barrages in your general direction. Assuming you’ve done what you came to do, you need to orient yourself toward a waypoint and do a light-speed jump to safety… after waiting for your hyperdrive to spool up, of course. (You actually can stay and fight the flagship, too, if you’re feeling cocky.) Many of my most thrilling moments have involved wrapping up a mission objective while a flagship bears down on me, jumping out while under heavy fire. Each mission can be attempted on one of three different difficulty levels, and completing bonus objectives will earn you an in-game currency you can use to unlock better weapons and perks for your ships. Some missions will also reward you with new guns and even more ships to add to your fleet. By the end of the game, you’ll be rolling deep with two or three Interceptors, a few destroyers and even a shielded frigate on your side. The more powerful my fleet became, the more fun I had going back and replaying earlier missions on higher difficulties. On the higher two difficulty settings, enemy ships have greater numbers, more firepower and stronger shields. It necessitates some dramatic shifts in strategy for missions that had previously been a cakewalk. 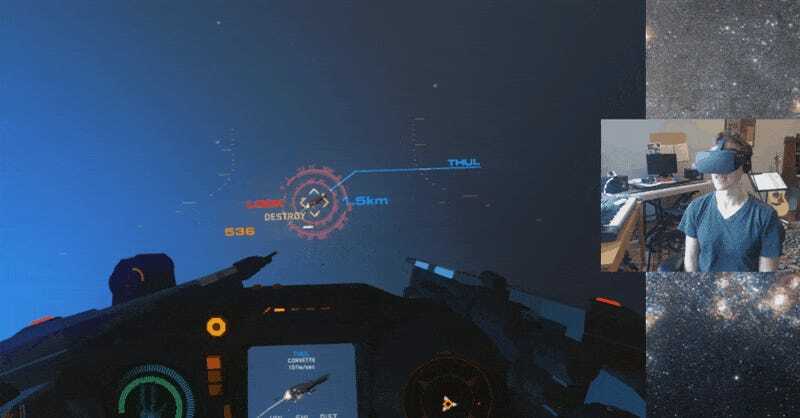 In addition to the in-cockpit view, House of the Dying Sun lets you pause and zoom out at any time for a Homeworld-esque tactical view. From there, you can take the lay of the land, issue orders to your squad, and work out how you want to prioritize targets. 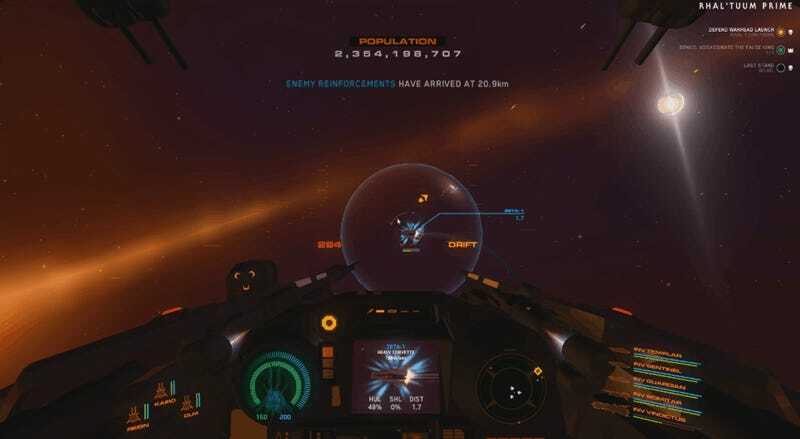 You can assume control of any Interceptors in your squad, which makes it possible to divide two fighters between two targets and hop between them to efficiently get the job done. (You can leave the AI to do this as well, but I’ve found I’m much more capable than my computer-controlled wingmen.) You can even unpause the game while remaining in tactical view, watching from a distance as ships careen around the battlefield. I love that the tactical view is an option, even as I’ve yet to get comfortable with some aspects of it. I wish it were easier to quickly determine my primary and secondary targets, and to give commands without giving the wrong one. I still frequently give orders to or assume control of the wrong ship, and it’s difficult to check on the current active target of each ship in my squadron. None of that has had a particularly detrimental effect on my progress so far, but given how tough some of Dying Sun’s most advanced challenges can be, it’d be nice if the tactical options were easier to use. In addition to the 14 scripted missions, Dying Sun also includes a challenge mode that summons in wave after wave of enemies for you to fight. Like everything in House of the Dying Sun, I had to keep my wits about me to survive. Challenge mode is a nice addition to the game, and I like how it lets me fight round after round without stopping. I still prefer the handcrafted encounters in the main missions, but it’s nice to have a randomly generated alternative. House of the Dying Sun controls beautifully with a game controller, a flight stick, or a mouse and keyboard. I do best with a standard game controller, though I’ve reprogrammed my Thrusmaster HOTAS for the game and it handles pretty well. (Most HOTAS setups require you to manually input button layout, which is a bit of a pain but doesn’t take too long.) I was pleasantly surprised by the game’s mouse & keyboard controls, too. You steer with mouse-look, and a cursor draws a line out from the center-point of the screen to indicate how sharply you’re turning. In addition to all the other things it does well, House of the Dying Sun also happens to be a sensational virtual reality game. It supports SteamVR, so you can play the entire game while wearing an Oculus Rift or an HTC Vive. I’ve used a Rift for a good chunk of my playtime, and Dying Sun has easily become one of my favorite VR games across any system. The chunky, almost cell-shaded art style makes it easy to tell what’s going on even in a crowded fracas, and the game’s overall visual simplicity keeps it from being overwhelming. House of the Dying Sun’s numerous achievements are all the more remarkable because it is largely the work of one man, an ex-AAA developer named Mike Tipul. In some ways, Dying Sun reminds me of Gunpoint, the terrific single-developer stealth game from 2013. While the games share little in common in terms of style or mechanics, both take a couple of good ideas and expand on them in smart ways without adding flabby padding. Both feel guided by a single vision, and both left me wanting more when the credits rolled.